Candy Cart and Sweet Buffets available to hire in any theme, colour or celebration style. A candy cart is a great way to satisfy a sweet tooth and create a wow factor at your celebration of occasion. 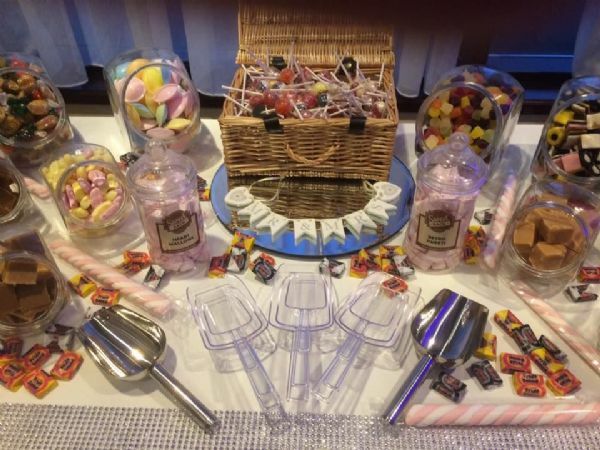 Our traditional hand made cart can be hired on it's own or with a fun selection of the most retro or current sweets including Black Jacks, Fruit Salads, Love Hearts, Flying Saucers, Drumstick Lollies, Cola Bottles, Milk Bottles, Flying Saucers or any other favourites you can think of. It will be colour coordinated or decorated to your theme or event style for a unique and creative finish.